Bury Town Under-18s held to a stalemate in their penultimate game of the season, after a great all round team performance ensured that the Blues kept a clean sheet for the third time in their last four matches. The Blues now make it 4 games unbeaten going into their last game of the season next Thursday, at home to Cornard United, having won their last three before last night. In a tight affair, it was Witham who had the first opportunity a minute into proceedings. The visitors’ corner in on the right was flicked towards goal at the far post but was cleared away by the Bury defence. Witham also had the first shot on goal in the fourth minute, No.9’s shot from the left hand side in the box was straight at Connor Reynolds who parried it away at his near post. Bury then had their first shot of the evening on seven minutes, Louis Johnson tried his luck from 20-yards out only to fire side of the left post. Four minutes later, Johnson was fed through on the left hand side in the box to again get a shot of at goal, this time though it was deflected behind the near post for a corner. From which, Ethan Heap leapt up at the near post to head towards the top near corner from close range, but was claimed by the keeper. Down the other end, Witham had a low shot at goal from edge of the box with 14 minutes on the clock- however a routine stop for Reynolds which went straight at the Bury keeper. Bury meanwhile almost had a penalty seven minutes later, after originally pointing to the spot when Amin Mohammad went down on the right hand side in the box, the referee consulted his linesman before correcting his decision to a corner for the Blues. On 22 minutes, Bury had a good chance to pen the scoring, when Tom Bristley headed just wide of the near post from a few yards out on the left. The home side followed that chance up by going close after 23 minutes, Amin Mohammad shooting just wide of the bottom near corner from the left edge of the box. Witham though had another chance on 25 minutes, as a forward turned in the left hand side in the box with the shot going just wide of the bottom left corner. The Essex outfit were then denied by a superb stop from Connor Reynolds a minute later, when a shot from outside the box was palmed away well by a strong hand of the Blues’ keeper down to his right. The Blues on the other hand had another chance on 29 minutes, Charlie Cook dribbled through down the left wing before spotting Amin Mohammad in the box. The latter then brought the ball forward to get a shot at goal, firing straight into the keeper’s chest at the near post. Two minutes later, Bury went close again, Charlie Cook doing well to progress through on the right hand side in the box, the skipper then went low for goal only to be denied by the foot of the keeper. The loose ball fell to Will Allison though, who had two shots blocked in quick succession. Eleven minutes before the break, Bury won a free kick on the left wing, which was swung into the box finding Ethan Heap close to goal, who only just missed the ball leaping up in the air. A scramble then ensued, from which Louis Johnson was able to get a shot a goal from just a few yards out but was blocked off the line. Charlie Cook then went close twice for the home side, as the first half drew to a close. The skipper’s free-kick on the right edge of the box went just wide of the far post, with Ben Lyddiatt inches away from getting a touch towards goal on 39 minutes. With the final chance of the half, Cook went agonisingly close to opening the score line, curling a cracking strike from the left twenty-yards from goal, with the face of the crossbar preventing the Blues from going in front a minute into stoppage time. The second half was tight and closely fought to say the least, with both defences desperate to hold onto their clean sheets. Bury though won a free-kick on the right wing a minute after the interval, Charlie Cook swung it in, finding Louis Johnson at the far post who headed wide of the target. The Blues then won an indirect free-kick inside the Witham box when the keeper picked up a back pass on 48 minutes, the set-piece was laid off to Charlie Cook whose strike was blocked. Witham meanwhile, went down the other end instantly, reaching the left edge of the box shooting straight at Reynolds, aided by a deflection, at his near post. Chances in the second half were few and far between, with the next opportunity falling with 70 minutes on the clock, when Witham’s No.10 turned past Matthews twenty-five yards out on the right as the shot went wide of the bottom near corner. The Essex outfit then shot wide of the top far corner, from twenty yards out on the left with time running out for either side to grab a winning goal, as 11 minutes remained on the clock. Witham then went close with 6 minutes remaining, after releasing a man through on the left hand side in the box, the shot went over the bar from close range. On 86 minutes, Witham then had another opportunity, skying a shot well over the bar from the left hand side inside the area. The two final notable chances also fell the way of Witham, whose free kick into the box was touched towards goal six yards from goal but was straight at Connor Reynolds. 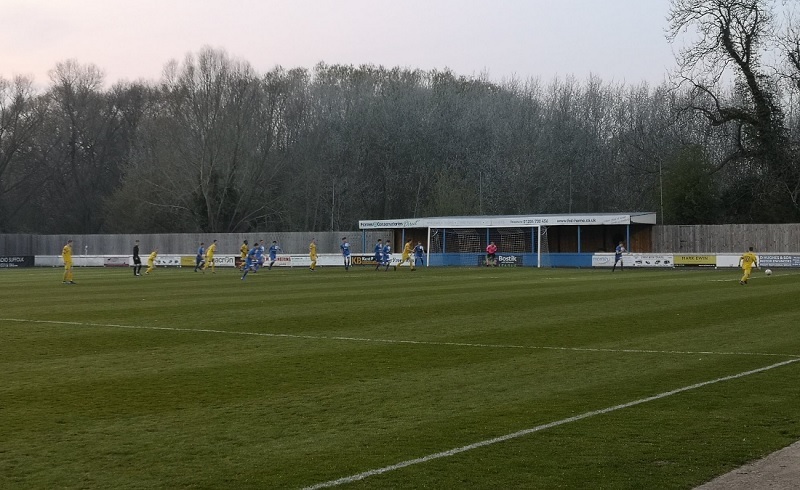 The last chance of the game also came from a Witham free-kick, this time the set-piece from the right edge of the box was tipped over the bar by Reynolds. With that, Bury kept their fourth clean sheet of the season, whilst Witham conclude their season with a solid performance away from home.